The site has been getting a lot of traffic lately, thanks to this tread over on Let’sRun.com. A new track planned at Austin Prep in Massachusetts is designed with two straightaways that are not parallel to each other, which also results to two different curves. If it gets built, I will definitely be posting it. The discussion has also lead into other uniquely shaped tracks, which is how I became aware of today’s track. Found on the campus of Seattle Pacific University, the Falcons track & field teams‘ home track certainly qualifies as unique. Obviously, this is used just for training, but it does have almost everything a team would need for practice. For field events, you have the discus/hammer cage, high jump area, pole vault, and javelin all at the northwest end of the track. I don’t see a pit for the horizontal jumps though, or a ring or sector for the shot put. They have a full length, 4-lane straightaway at the top, with exchange zones painted. They also have a curve to use, with exchange zones marked here too, but it is an inconsistent arc over the length of the turn. You’ll notice that in southeast section of the track, it narrows down to just two lanes. The track has been resurfaced within the past few years, along with the installation of new artificial turf. The infield before that used to be grass, and the actually had a second softball diamond in the southeast corner as well. 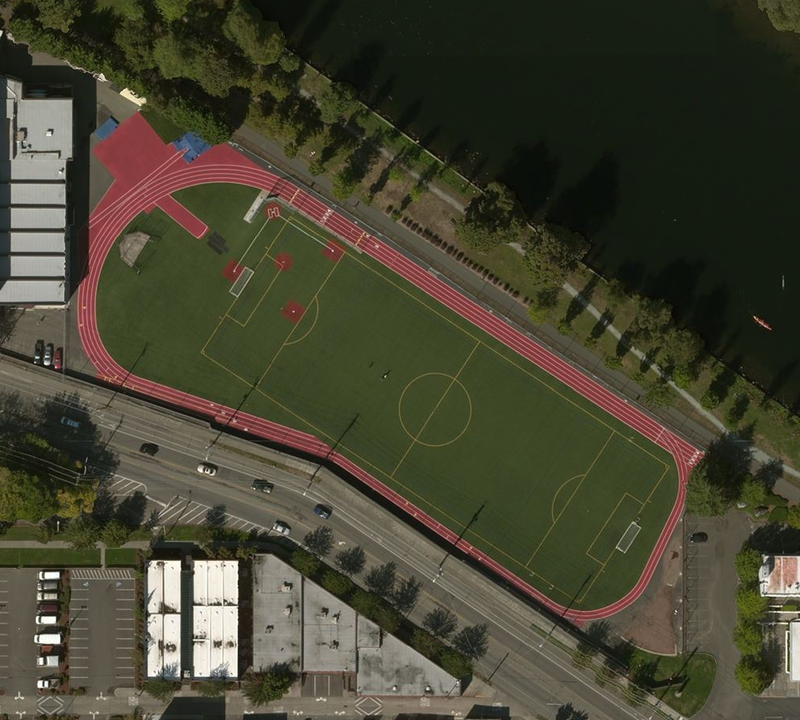 It’s a good surface to train on, but the shape of the track with the sharp turns surely makes it difficult to train properly, especially for a college team.